Well, it has unintentionally been aaaaages since my last post, but that doesn’t mean that all has been quiet on the crafting front. In fact I had a summer pretty full with crafting successes! It just turns out that finding a) the time and b)keeping items clean enough for photographing when there’s a little man around is nigh on impossible! My favourite summer makes were my Serendiptiy Studio Tara tunic made in a brilliant aqua scooter print cotton from Fabric Rehab and my By Hand London Anna dress which, barring a slight gaping at the top issue is possibly the best dress I have ever made myself, fully lined and well fitting straight off. I made it in a lovely black rayon linen blend from Minerva. I plan on making more of both of these patterns for next spring and summer so maybe I’ll get a chance to photograph them then. I also made a pair of Colette Clover trousers in the cropped style, which I was pretty pleased with, they’re too big, but the construction was good and I have enough fabric left to try another pair. Oh and I almost forgot my Colette Laurel top made in a lovely double gauze from The Village Haberdashery. I like it so much I am itching to make a Laurel dress, maybe I’ll get a chance over the Christmas break. There was also time for a little knitting and I made myself Sirdar drapey waterfall cardigan in a gold bamboo yarn as I needed something pretty neutral to go over summer dresses. Then crafting time seemed to disappear except for the odd half hour snatched here and there over a weekend. Not enough time to trace a new dressmaking project out, but time enough to crack on and finish some items from the big bag of ufos (unfinished objects for the not so crafty among us). 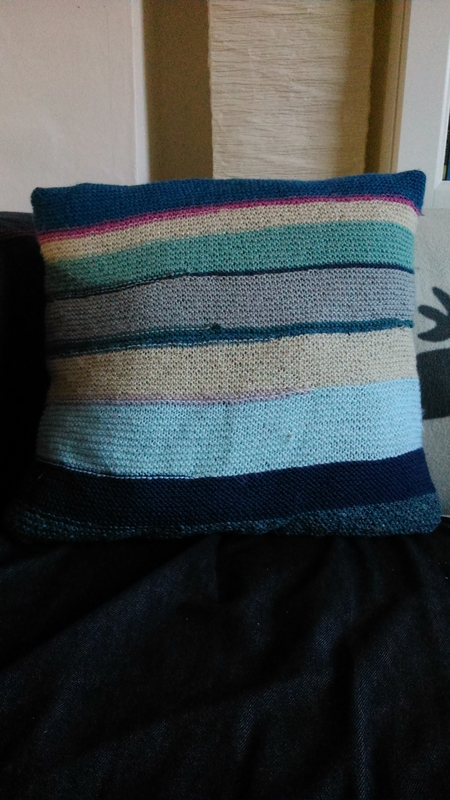 They are all cushion covers as they tend to be my go to project when stash-busting whether it be yarn or fabric, but I do love cushions and as chance would have it, I needed to replace some of my sofa cushion covers anyway. 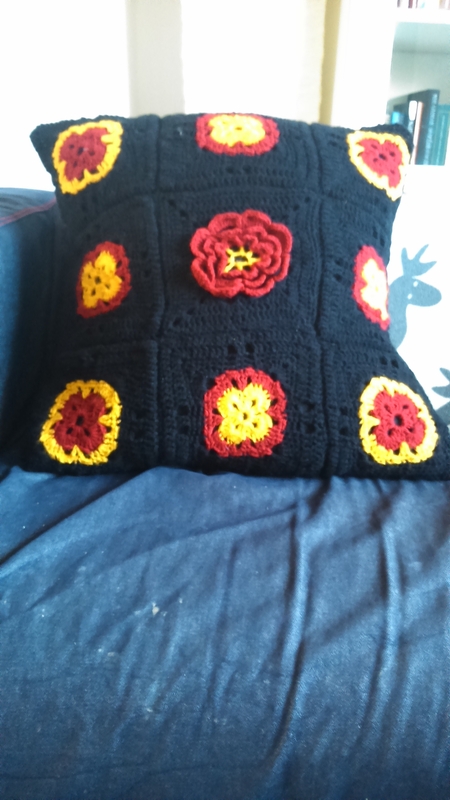 So here we are, a collection of cushion covers now finished! The crochet blocks were taken from this book and the yarn is some cheap dk acrylic leftover from some toy knitting I don’t seem to have blogged either (bad blogger). 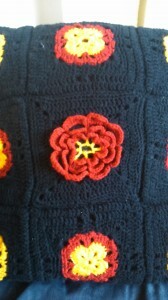 I am very pleased with the central flower block. I would like to make a blanket using these blocks but there’s no way I have the staying power, I hate knitting or crocheting blankets (and scarfs). It is simple and I like it, it’s also pretty soft, there’s some Roawn cashsoft in there! 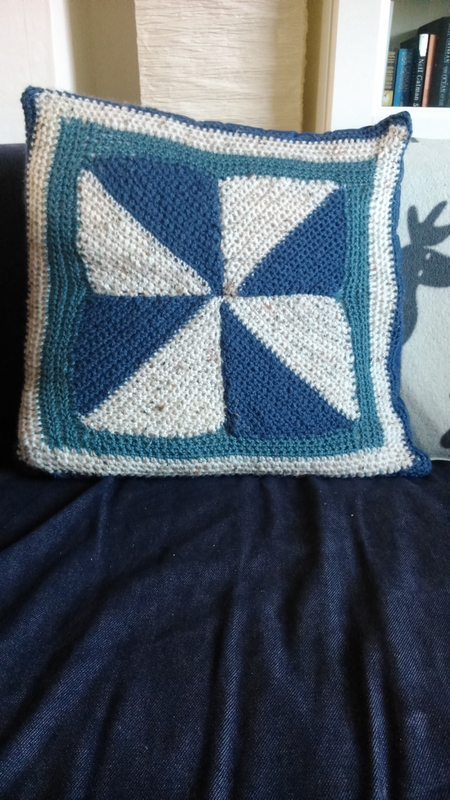 I should say that when I knit or crochet a cushion I baste the knit front to a square of fabric and tack it in few spots to prevent them from stretching out too much and losing their shape, they are then backed with a plain cotton. The first two are straightforward envelope backs and the pinwheel has a zip (just because the fabric amounts I had to hand necessitated this). I love English Paper Piecing, it is normally my in-between projects project and so can take me ages but it is such a portable craft and I have some grand dreams/plans for an EPP quilt. You may recognise some of the fabrics in this cushion from previous dressmaking projects. Another reason I love EPP! Well, that’s it for now, I should have a couple of knitting projects to post about in the next week or two that don’t require me to model them, it will be mainly finding enough light for halfway decent photos that will be the problem. 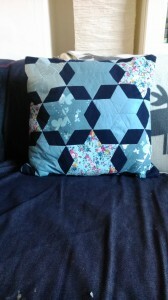 Oh I just have to mention how absolutely lovely Susan from Sewbox is. She ordered the Serendipity Tara Tank dress in for me and managed to get me a couple of By Hand London patterns which were sold out everywhere. An absolutely lovely person to buy from.